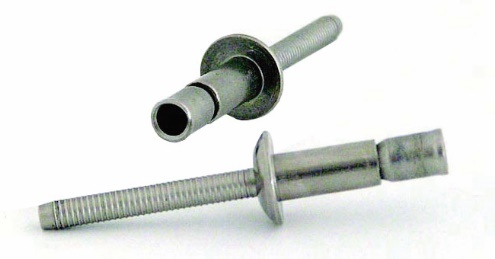 Structural high strength fastener, designed to be used in single-sided structural applications with heavy loads. Bralo Structural rivet is synonymous with security and performance. Bralo Structural Rivet is designed to fix elements where a high resistance to both tensile and shear strengths are required. This fastener has been designed for heavy-duty fastening applications and ensures a quality fastening. Due to its feature of adaptive expansion, the same size can be used for different thickness. This rivet guarantees a homogeneous riveting whatever the thickness, and ensures the locking of the mandrel inside the head, obtaining thus a great tightness. High tensile and shear strength. High tightness. The joints are completely watertight. Multi-grip range feature. Being a multigrip rivet, it offers the possibility to work in a big variety of grip ranges. Just two sizes of this rivet covers a grip range from 1 to 16 mm, reducing the number of rivets to be stored. The hole is completely filled through a radial expansion of the rivet. It allows to compensate uneven, misaligned, oversized or grooved drills. Firm and high-quality joint, vibration-resistant due to its internal mandrel locking. High resistance mandrel. It allows rapid assembly of parts with large separations. Versatility. Just one size can be used to replace several rivets with standard grip ranges. Diameters: 4.8 mm., 6,4 mm. y 9,7. Heads: Dome and Countersunk heads. Steel Lacquering, zincating (galvanized and alloys) and organic coating. Stainless steel Passivation and lacquering.